Stated simply, these are the wrong questions: as wrong as asking why TV producers aren’t busily commissioning series about perfume, watches, beer, coffee – or chicken. As wrong as my seven-year-old asking why she can’t have ice cream with every meal. Of course, even wrong questions have sensible answers, and the brief response to the “why doesn’t the media dedicate more space/time to wine, perfume or chicken?”, is that too few people will want to watch/read it. (Please don’t argue with this statement: it’s based on the international experience of a wide range of media outlets; successful wine-focused wine books, magazines, columns and programmes with big audiences are rare exceptions to the rule). But there is a far more interesting question that gets asked far less frequently. Why don’t we see more wine in food and travel and other lifestyle programmes and publications with proven popularity where, like the coffee and the chicken, it has an obvious role. Why don’t I hear the people who complain about being starved of wine TV ever talk about the lack of all but the briefest references to wine in restaurant reviews? Or about the absence of wine suggestions to go with the recipes in women’s magazines? And why, while I’m at it, are there so few mentions of food in so many wine books and articles? It’s as though food and wine live in separate worlds, like Victorian men and women or blacks and whites in the southern US of the 1950s. Those of us who don’t like segregation have two choices. We either simply go on complaining about it, or we try to change the situation ourselves. Wine producers could – now here’s a really weird notion – save some of the money they throw away on glad-handing wine writers with tiny audiences and spend it on getting to know some food writers. The people charged with promoting wine regions could start to talk to the people responsible for those same regions’ tourism campaigns. Instead of running expensive advertisements depicting the same old images of bottles, barrels, vineyards and grapes, the marketing departments of the bigger wine companies could start to look at ways of putting the stuff they sell in the context of the stuff with which it will actually be consumed. When saying all this, I’m talking from experience. Of the 25 books I’ve written, the three that still help to pay the bills have, coincidentally or not, been the ones that feature food. This was not, I should say, originally my choice. My Complete Encyclopedia of Wine which has won some nice awards, originally began life – surprisingly to some – as an own-label book for Tesco, and it was the supermarket that suggested the inclusion of recipes. At first, I couldn’t see the point but, when I saw the sales figures, and some of the comments from readers, I ate my helping of humble pie. included in every fact box. 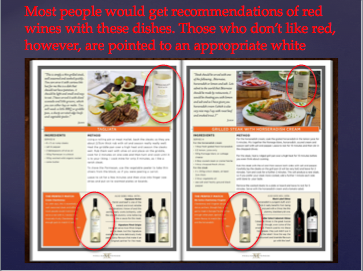 When Dorling Kindersley approached me about producing a guide to French wines, food and travel pages were almost automatically built into the project – as were food recommendations for every wine. This time I didn’t argue – and French Wines has been by far my biggest seller, with editions in languages including French, German, Russian and Chinese. The Wine Travel Guide to the World was intended to serve as a companion for anyone who travels and enjoys wine, so it seemed natural to include restaurants, wine bars and museums as well as wineries. I’ve had similar experiences in the press. For over 14 years, I contributed a weekly wine column in the Sunday Telegraph. Nowadays, that same newspaper sometimes asks me to write about wine sto go with articles in its travel section. One commission, for example, involved recommending wineries in Australia to visit while following England’s cricketers on their last Ashes tour down under. The difference between the impact of writing a wine column in the food section, and having a few hundred words on the travel pages was dramatic. After all those years of often meeting Sunday Telegraph readers who’d never read any of my wine columns, I suddenly kept finding myself encountering complete strangers who’d devoured my contribution to the travel pages. Some wine companies and regions are, of course, exploring ways to think outside of the wine box. Barefoot Wines for example offers recipes galore on its website, while Bordeaux is increasingly focusing on food with its Good Food Would Choose Bordeaux and travel. My own Wine Travel Guide to Wine would never have seen the light of day without sponsorship from Pernod Ricard. And the Savour Australia event in Adelaide, to which I’m heading next week has apparently been jointly funded by Australia’s wine and tourism bodies. Apart from projects like these, created on behalf of other wine producers, I’m now putting (rather a lot of) my own money where my mouth is by launching a website that’s totally dedicated to breaking down the apartheid between food and wine. Greatfoodandwinesites.com is an online encyclopedia that will gradually cover every aspect of food and drink – via the best websites and videos and podcasts, all of which will be rated and reviewed by users. How does it differ from Google? you may reasonably ask. First it’s totally focused on food and drink, and second, it’s quality controlled. Only good sites are included and over time users – who will be given an incentive to do so – will use their opinions to ensure to separate the best from the rest. At the heart of the concept lies a paradox. On the one hand, it aims to save users’ time by enabling them to find the information they want/need quickly and efficiently; on the other, it will encourage them to “waste” time by seducing them into browsing subjects they didn’t know they were interested in. So, someone looking for an abalone recipe might watch a video showing how to prepare it, before being tempted to read a blog post about algae that are being developed as a healthy alternative to butter, an introduction to Algerian wine, latest research into food allergies – and a list of recommended Albariños. Will it work? We’re still building it, tweaking the software – and planning the incentives that we’re going to offer users to interact with the site. But it is already attracting a lot of interest from both food and wine professionals, and visitors are spending over four minutes per visit and looking at several pages, so I’m feeling optimistic that we’re on the right track. In any case, I feel much happier actually trying to give non wine-enthusiasts a reason to explore the subject for themselves rather than moaning about the media failing to do our job for us. Agree with most of this, Robert. Wine craves context. It needs food (usually), good company (always) and pleasant surroundings (if available). Watching someone taste a wine in a TV studio then describe the flavour is pointless. For most consumers, reading an article that's just about wine in pointless. However I think we can overstate the importance of wine tourism (how many of us can really afford to visit wine regions, or would divert the annual holiday funds in this direction?) and we also need to be careful about the food matching side of things. It's useful to know a bit about a wine's local cuisine, but we can be (or appear to be) too prescriptive. 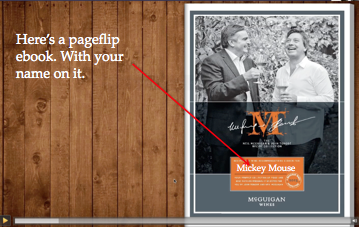 To my mind the most effective wine marketing of all is to let people taste the good stuff – let them see why it's worth buying from a specialist and spending a bit more. And make it fun. Thankfully there are hundreds of indies in the UK doing exactly that. Good points here, Graham. Where we part company is over the overlooked factor of fantasy. People fantasise about food they'd cook and eat and the restaurants in which they'd eat it. They also fantasise about places to which they might – in a parallel life – like to travel. Very few non wine-lovers actually fantasise about drinking Lafite or Leroy (though some might have dreams of Champagne), just as few non-musicians have reveries of owning a Fender Stratoscaster or a Stradivarius. Putting wine in the context of food, travel or indeed celebrity, is to hitch a ride on some popular dreams.